Last night, both California’s Senate and Assembly passed SB 743, Senator Darrell Steinberg’s legislation that replaced his original CEQA reform bill, SB 731, which promised to end the reign of Level of Service (LOS) in California urban planning. SB 743 would still eliminate of LOS to a more limited extent, and although it’s unclear if Governor Jerry Brown will sign the bill, he reportedly assured Steinberg he would do so because he favors a more tepid CEQA reform bill. SB 743 was drafted primarily to streamline environmental review for a new stadium for the Sacramento Kings basketball team. While SB 731 would have brought the statewide elimination of LOS — a car-centric transportation planning metric that basically puts the movement of cars over everything else — as part of environmental review, SB 743 would still nix the metric for projects within designated transit priority areas (TPAs). Large swaths of most urban areas are considered TPAs, which are defined as areas within a ½-mile of high quality transit: a rail stop or a bus corridor that provides or will provide at least 15-minute frequency service during peak hours by the year 2035. Despite the LOS victory, many advocates fumed that it didn’t go far enough. Not a single environmental group backed the legislation, and thirteen — including The Sierra Club, Trust South L.A., and the Planning and Conservation League — signed a letter blasting the legislation as a “gut-and-amend.” SB 731, Steinberg’s larger CEQA reform bill that didn’t pass, would have ended the requirement to use LOS for the entire state. Under current law, the impact of projects, even ones that are building bike lanes, must be measured based on how the project interrupts or supports the flow of car traffic. This has lead to the creation of wider, faster streets and the laying of more asphalt to “mitigate” those projects’ impacts. While most environmentalists and transportation reformers agree that this change to LOS is a positive step, many are angered that SB 731 was shelved so that a basketball team owned by billionaires could get an expedited environmental review that would lack teeth because the legal options available to the opposition are greatly reduced. Meanwhile, the CEQA Working Group, a coalition of business interests who want to do away with environmental protections, were happy to see broad CEQA reform shelved until next year. The group, which is co-chaired by the Los Angeles Chamber of Commerce President Gary Toebben, has refused to correct a report released in its name last week that falsely claimed CEQA lawsuits prevented the creation of construction jobs for the Expo Light Rail Line in Los Angeles. Broad CEQA reform will have to wait until next year. As Autumn Bernstein joked on Streetsblog yesterday, there was good news for fans of bicycling, transit and transit oriented development yesterday. But, there was even better news for big businesses that don’t want to play ball with the state’s environmental laws. 65088.4. (a) It is the intent of the Legislature to balance the need for level of service standards for traffic with the need to build infill housing and mixed use commercial developments within walking distance of mass transit facilities, downtowns, and town centers and to provide greater flexibility to local governments to balance these sometimes competing needs. 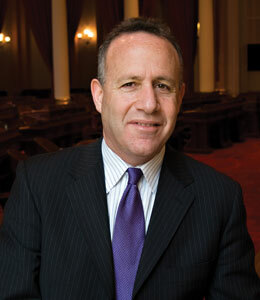 Today is a very proud day for Senator Steinberg, the entire state legislature, and Governor Brown. California is leading the nation again in turning to sustainable urbanism, and away from government-mandated sprawl and climate chaos. – They prefer to beat up infill developers and have the poor to be displaced quickly into suburbs when infill is stopped, rather than get out of way and slow displacement through infill. That is my reading as well. As soon as Governor Brown signs it, which I’m 99% sur ehe will. – Replacing Auto-LOS, basically “how enjoyable is it to drive?” with a real measure of the negative impact of generating traffic. LOS pushes cities to degrade good streets into Stroads and makes exurban spra look better than infill. Do you know how frustrating it is when an EIR says the more You develop next to a NART station and the less parking on-site, the WORSE it is for the environment? When the EIR that is supposed to inform decision making and mitigate impacts instead misinformed and Directs a city to actively spend money to damage the environment? That era is ending now thanks to SB 473. I admit that it’s unfortunate that LOS wasn’t removed as a requirement statewide, but to some degree I think it’s a distinction without a difference. Places without high quality transit aren’t going to be abandoning LOS any time soon, because LOS is the basically the only thing that matters in areas without transit. It’s a positive change in the areas where it’s going to make the biggest difference (TPAs), and I think we should celebrate that even as we work for and expect more. With the exception that bicycle transit is available anywhere. So the “business as usual” LOS based decision making in public transit poor areas will continue to discourage cycling. Still this is a step in the right direction. For decades LOS maintenance was standard operating procedure. This new legislation opens up a little exception that could help change how decision makers think about improving transportation. FYI, I believe that the City of San Jose changed their LOS rules to exempt transit rich areas like this many years ago. As I recall the city determined that growth was overly constrained in core city areas because there’s no more room to increase traffic lanes and hence satisfy LOS. But underutilized transit (LRT especially) was already in place to pick up the slack. The question is, will EIRs still need to include analyses of LOS (once LOS changes can no longer be considered significant impacts)? Transit Priority Areas, though, are a useless metric that could include high density condos near park and ride lots (such as the Foothill Transit park and rides, most of which have bus service more than every 15 minutes) and could increase sprawl. Just because a place gets four buses an hour (by 2035! way to look at the crystal ball!) does not mean it should be exempt from traffic analysis. Are they really replacing LOS with a “vehicle-miles traveled” measure? If that doesn’t include cyclists or pedestrians, and only counts buses as a single vehicle, then this seems just as bad. Shouldn’t it be “person-miles traveled”? Please stop spreading misinformation. LOS is NOT part of the LAW of CEQA, it’s in the GUIDELINES, only. The law must always be followed, but guidelines are recommendations, only, and may be ignored. Finally, since CEQA is self-executing, an agency can decide where it applies. Let’s face it, local agencies _choose_ to follow LOS guidelines because they agree with them. It’s only found on page 268 in the guidelines. Last time I checked the OPR does not legislate. Is CEQA Reform Truly on Its Way? If It Is, Should We Be Happy or Worried? Like Bike Lanes and Transit? Hope You Like the Sacramento Kings Too.